Plan to have the list ready when your invitations are scheduled to be complete (typically eight to 10 weeks prior to your wedding date). 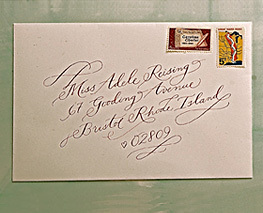 Calligraphers generally require between two to four weeks to complete the addressing. 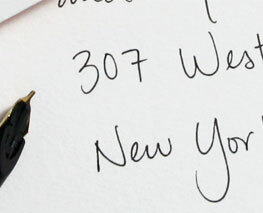 Suggested Use: Hand-calligraphy is a beautiful finishing touch on any invitation, and it promises that stunning first impression that's so important to us all. While Regas recommends this option for the actual invitation, we do suggest holding off on hand-calligraphy for save the dates and other pre-invite correspondence: it's completely normal to opt for a less costly means of addressing on those earlier items. List format: To proceed with calligraphy, you'll need to provide your address list in the form of a downloadable Word or Excel document depending on the preference of the calligrapher. Envelopes will be addressed within two week of the finalized list delivery, which makes computer calligraphy a great choice when you're running a bit behind schedule. Additional requirements: Addresses are printed exactly as they have been typed into your excel sheet. Be sure to double-check spelling and punctuation! 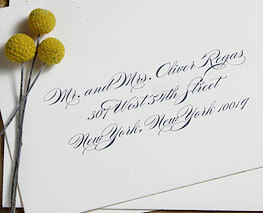 A more budget-friendly alternative to hand calligraphy, addressing by computer provides a clean, coherent look often difficult to discern from actual hand written names and locations. The type style is set to work perfectly with the inside card design (you can often achieve a more perfect "match" with this form of calligraphy!) The address is printed directly on to the envelope (unless of course you select a specially-designed Regas label to apply to the envelope for a cool, fun, modern look). Suggested Use: Perfect for save the date cards! This helps to keep from overcomplicating the look and feel of that initial correspondence, and also keeps the budget in check. Computer calligraphy is not recommended for the actual invitations. So much care goes into creating a personal and meaningful invitation. If calligraphy is not in your budget we strongly suggest hand addressing (see option 3). Estimated cost: $50 set up fee. $1 per envelope addressed. If list editing is required we will bill at $100 per hour. We'll give you the option to revise the list yourself before any work is done. List format: You'll need to provide your address list in the form of a downloadable Excel spreadsheet. Following the address formatting recommendations below guarantees a smooth computer calligraphy experience (and no additional fees!). Download our detailed Addressing Etiquette Guide for more information. No Abbreviations. Spell out all street names and state names. Correct punctuation. Capitalize all titles, names, cities, states, and so on. Write "Meredith Regas", not "meredith Regas"
Write "Palm Beach", not "Plm. Bch"
If you'd like to address formally, be sure to include all titles. Write "Mr. and Mrs. Charles Smith", not "Mr./Mrs. Charles Smith"
Write "Dr. and Mr. Stephen Regas", not "Dr. Wendy and Mr. Stephen Regas"
Depending on how many guests you're inviting, and therefore how many envelopes you're addressing, we recommend allowing at least two to three weeks to get all envelopes written. You want to make sure you're covered in case your volunteer gets called away from the task for any reason. Perhaps you have a close friend or relative who has been clamoring to help out with wedding plans… but you've yet to think of just the right honor. Or maybe you're looking to save on the invites a bit, so that the extra champers is an option for the toast. It could even be that you have a favorite pen you just can't wait to use! Regardless of the reason, we at Regas are always in favor of making your paper as personal and meaningful to you as possible. If your mom,' aunt, good friend, or cousin has nice handwriting and has offered to share her talents, this is the time to say yes! Just keep in mind that hand writing is a time-consuming endeavor: you'll want to order your invitations with extra time so that it's not too stressful for your volunteer. Finally, make sure your list is in order (check it twice!) and that you've got a comfy chair and well-lit writing area set up. Happy addressing!